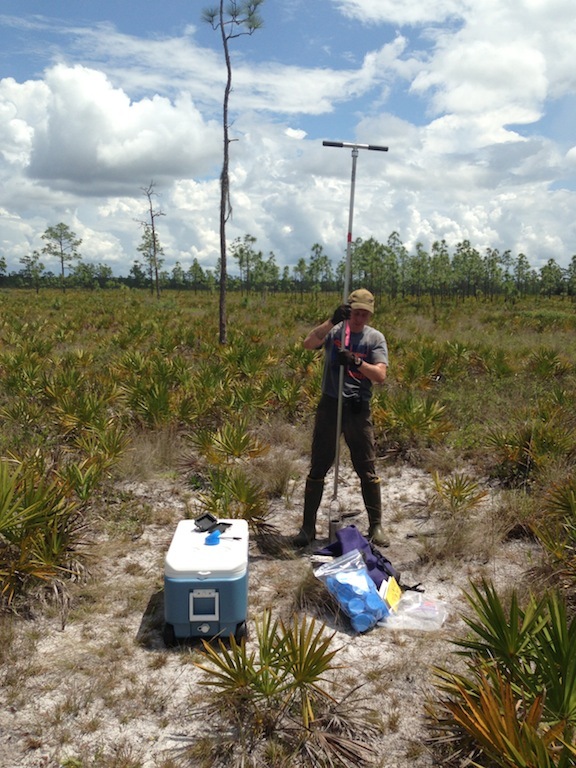 Sampling soil cores in Disney Wilderness Preserve, Florida. Bond-Lamberty joined the PLOS One Editors in September 2013. Congratulations to Dr. Ben Bond-Lamberty, terrestrial scientist at Pacific Northwest National Laboratory, who was appointed as one of 39 Section Editors of the open-access Public Library of Science (PLOS) One, the largest scientific journal in the world. As a PLOS Section Editor, he will use his research expertise in climate change, carbon cycle, and ecosystem modeling to evaluate manuscripts, and consult on study design, scope, and ethics. Bond-Lamberty also blogs for the journal's EveryONE blog. Bond-Lamberty's research interests include carbon and nutrient cycling in terrestrial ecosystems, particularly (but not exclusively) high-latitude northern ecosystems, disturbance effects, climate change, and multiscale modeling. With more than 45 publications, he is a member of the American Geophysical Union, Ecological Society of America, and the American Association for the Advancement of Science. PLOS is a nonprofit publishing, membership, and advocacy organization for progress in science and medicine by leading a transformation in research communication. Bond-Lamberty works out of the Joint Global Climate Research Institute, a partnership between PNNL and the University of Maryland.